This form is a real estate purchase contract for the all cash acquisition of a luxury hotel and spa that is flagged with a national hospitality franchise. The agreement provides for a due diligence review period lasting a specified number of days during which the buyer conducts its due diligence for the purchase. The hotel is located on land owned by the seller, and on land that is ground leased to the seller. The purchaser is acquiring the fee parcel and taking an assignment of the ground leased parcel. The seller is obligated to furnish extensive documentation concerning the hotel for the buyer's evaluation, including information regarding warranties and licenses, financial matters, tax statements, construction drawings, service contracts, governmental notices, and the like. 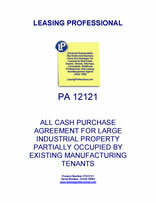 THIS PURCHASE AND SALE AGREEMENT (the "Agreement") is made to be effective as of the ____________, 20__ (the "Effective Date"), by and between COMMERCIAL PROPERTY SELLER, a general partnership formed under the laws of _________ ("Seller"), having an office at _________________ and COMMERCIAL PROPERTY PURCHASER, L.L.C., a _________ limited liability company ("Purchaser"), having an office at ______________________. (j) all of Seller’s right, title and interest in and to all intangible personal property relating solely to ownership and operation of the Land, Hotel and Improvements, including, without limitation, names related to the Hotel and all related goodwill and domain names, excepting, however, any Operator Names, Operator Symbols or other Proprietary Materials of Operator, all as defined in the New HMA. The property described in this clause (j) of Section 1.1 is referred to as the "Intellectual Property." 1.2 Property Defined. The property described in Section 1.1 is referred to collectively as the "Property." 1.3 Permitted Exceptions. The Property shall be conveyed subject to the matters which are, or are deemed to be, permitted exceptions pursuant to Article II (collectively, the "Permitted Exceptions"). 1.4 Purchase Price. Seller shall sell and Purchaser shall purchase the Property for a total of ______________ MILLION DOLLARS ($_________) (the "Purchase Price"), as increased or decreased by prorations and adjustments provided for in this Agreement. Seller and Purchaser acknowledge and agree that (a) _____________ Dollars ($__________) of the Purchase Price is allocable to the Land and the Improvements and (b) _________ Dollars ($_______) of such figure is allocable to the Residential Development Parcel. Seller and Purchaser shall complete and sign a conveyance tax certificate required in connection with the transaction setting forth information consistent with the agreement set forth in clause (a). 1.5 Payment of Purchase Price. The Purchase Price, as increased or decreased by prorations and adjustments provided for in this Agreement and less the amount of the Deposit (as defined and payable by Purchaser in accordance with Section 6.1 below), shall be payable in full at Closing in cash by wire transfer of immediately available federal funds to a bank account designated by Pretty Good Title Insurance Corporation ("Title Company") in writing to Purchaser prior to the Closing. Said funds shall be so deposited at least one (1) business day prior to the date of Closing. 1.6 Delivery to Title Company. Upon mutual execution of this Agreement, the parties shall deposit an executed copy of this Agreement with Title Company and this Agreement shall (along with the escrow instructions described in Section 1.6 and such supplementary instructions not inconsistent with this Agreement as either party hereto may deliver to Title Company) serve as escrow instructions to Title Company for the consummation of the purchase and sale contemplated hereby. Seller and Purchaser agree to execute such additional escrow instructions as Title Company may reasonably require and which are not inconsistent with the provisions hereof; provided, however, that in the event of any conflict between the provisions of this Agreement and any supplementary escrow instructions, the terms of this Agreement shall control. 1.7 1031 Exchange. If any party hereto elects (the "Electing Party") to conduct a tax free exchange under Section 1031 of the Internal Revenue Code, as amended, then the other party hereto agrees to cooperate (the "Cooperating Party") with the Electing Party in conducting such tax free exchange under such Section 1031 of the Code relating to this transaction. In the event of such an election, the Electing Party agrees to indemnify, defend and hold the Cooperating Party harmless from and against any and all claims, demands, causes of action, liabilities, costs and expenses, including reasonable attorneys’ fees and costs of litigation, that the Cooperating Party may suffer or incur by reason of such exchange. Purchaser and Seller expressly reserve the right to assign their rights, but not their obligations, hereunder to a Qualified Intermediary as provided in IRC Reg. 1.1031(k)-1(g)(4) on or before the Closing Date. Each Cooperating Party agrees to cooperate, but at no cost, expense or risk to said Cooperating Party, and take any actions reasonably requested by the Electing Party to cause such exchange to be consummated and to qualify as a like kind exchange under such Section 1031 of the Code, including, but not limited to, (a) permitting this Agreement to be assigned to a Qualified Intermediary and (b) conveying the Property to, or at the direction of, the Qualified Intermediary. In no event, however, shall any such exchange extend, delay or otherwise adversely affect the Closing Date (except as contemplated in Section 4.1, below). The provisions of this Section shall survive the Closing. All references in this paragraph to tax-free exchange under Section 1031 of the Code shall include "reverse exchanges" as set forth in Revenue Procedure 2000-37, 2000-2 C.B. 308. 2.1 Title Examination; Commitment for Title Insurance. Purchaser has obtained from the Title Company an ALTA Commitment for Title Insurance dated _________ and issued under File No. __________ (the "Title Commitment") covering the Property. Purchaser shall have until the close of the Inspection Period (as defined below) to review the Title Commitment and at Closing to obtain from the Title Company an owner’s policy of title insurance in the full amount of the Purchase Price pursuant to Section 2.4. 2.2 Survey. The parties acknowledge that Seller has delivered to Purchaser and the Title Company Seller’s existing ALTA survey of the Property (the "Survey"). Purchaser may, at its sole cost and expense, update and recertify the Survey. 2.3 Title Objections; Cure of Title Objections. Purchaser acknowledges that any item contained in the Title Commitment or any matter shown on the Survey shall be deemed a Permitted Exception, provided that Seller agrees that, in any event, all monetary liens (other than liens for bonds and special assessments that are not yet due and payable) consisting of (A) any mortgage, security agreement or other encumbrance granted by Seller or expressly assumed by Seller, (B) any federal or state income tax liens against Seller, (C) any judgment liens against Seller and (D) any inchoate mechanics’ liens arising out of any work of improvement performed at Seller’s request and not subject to proration pursuant to this Agreement, as applicable, shall be removed at Seller’s sole cost and expense on or prior to the Closing Date and shall not be treated as Permitted Exceptions. (e) items appearing of record or shown on the Survey, general and specific plans and development permits, and, in either case, not objected to by Purchaser or waived or deemed waived by Purchaser in accordance with Sections 2.3 or 2.5. In connection with issuance of the Title Policy, Seller shall deliver to Title Company customary certifications and affidavits to the Title Company, including certifications and affidavits relating to the status of leases and mechanics’ liens, but shall not be required to escrow any monies with the Title Company in connection therewith. 2.5 Pre-Closing "Gap" Title Defects. In the event that any matters of record are not identified in the Title Commitment, the Survey or by Purchaser during the Inspection Period or otherwise arise only following the close of the Inspection Period ("Intervening Title Matters"), such matters shall be treated as Permitted Title Exceptions for all purposes, unless Purchaser shall have furnished a notice to Seller of an objection to such Intervening Title Matters not later than the Closing Date setting forth the nature of the Intervening Title Matter in reasonable detail. In the event Purchaser shall so notify Seller of objections to Intervening Title Matters, Seller shall have the right, but not the obligation, to cure such objections. Seller shall notify Purchaser in writing prior to the earlier of (a) two business days following receipt of Purchaser’s notice of any objection or (b) the Closing whether Seller elects to attempt to cure such objections. If Seller elects to attempt to cure, and provided that Purchaser shall not have terminated this Agreement in accordance with Section 3.2, Seller shall have until the Closing to attempt to remove, satisfy or cure the same and for this purpose Seller shall be entitled to a reasonable adjournment of the Closing if additional time is required, but in no event shall the adjournment exceed thirty (30) days after the date for Closing set forth in Section 4.1. If Seller elects not to cure any objections to Intervening Title Matters specified in Purchaser’s notice, or if Seller is unable to effect a cure prior to the Closing (or any date to which the Closing has been adjourned), Purchaser shall have the following options: (i) to accept a conveyance of the Property subject to the Permitted Exceptions, specifically including any Intervening Title Matters objected to by Purchaser which Seller is unwilling or unable to cure, and without reduction of the Purchase Price; or (ii) to terminate this Agreement by sending written notice thereof to Seller, and upon delivery of such notice of termination, this Agreement shall terminate and thereafter neither party shall have any further rights, obligations or liabilities hereunder except to the extent that any right, obligation or liability set forth herein expressly survives termination of this Agreement. If Seller notifies Purchaser that Seller does not intend to attempt to cure any Intervening Title Matter objection; or if, having commenced attempts to cure any objection, Seller later notifies Purchaser that Seller will be unable to effect a cure thereof; Purchaser shall, prior to the Closing, notify Seller in writing whether Purchaser shall elect to accept the conveyance under clause (i) or to terminate this Agreement under clause (ii) of this Section 2.3. For the purposes of this Section 2.5, Seller shall be deemed to have effected a cure of a title objection if the Title Company is willing fully to insure over such matters by endorsement or otherwise, in form reasonably satisfactory to Purchaser and without the payment of any premium or charge other than premiums or charges Seller, in its discretion, shall undertake to bear.